SBA 504 loans are designed to help small businesses owners purchase commercial real estate and equipment. Benefits include long-term repayment schedules, as well as fixed interest rates that are set well below traditional market interest rates. Below Market Fixed Rates: The SBA 504 loan offers rates that are set for the duration of the loan, without balloons later. The rates are also set lower than standard market rates and are amortized over 20 to 25 years, so borrowing for development is easy to budget. No Additional Collateral: While some loans require that you pledge personal assets, such as your home or vehicle, the SBA 504 loan is secured by your purchase. Can Include Closing Costs and Fees: As with most loans, there are closing costs and other “soft fees,” such as insurance and appraisals, that are necessary in order to process the loan and receive funding, but they can be rolled into the loan, so you can keep more cash on hand for daily needs.. If your commercial property is at least 51% owner-occupied, small-business loans from AVANA Capital can help you acquire, renovate, or build commercial real estate properties. SBA 504 loans may also be used to purchase heavy equipment that is necessary to keep your operation running or to boost productivity. Typically, you’ll only need 10% – 20% of the total cost of your project as a down payment. Additional funding to cover the remaining balance is typically broken into two lien loans. 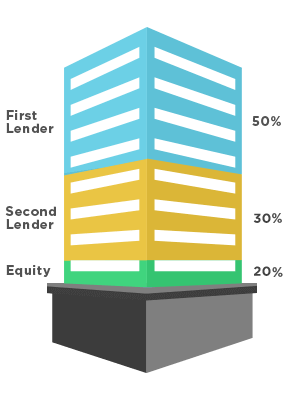 The first lien loan covers 50% of the total cost, while the second lien loan, which is secured by the SBA, will cover the rest. The team at AVANA can deliver your pre-approval within 24 hours, with closing in as little as 45-60 days. We offer very competitive rates, and your loan can be paid off over a period of 20 or 30 years, making it easy to grow your company and maintain more working capital. Your information has been sent to AVANA. Thanks! The information provided by this calculator is intended for illustrative purposes only. AVANA Capital shall be under no obligation to fund any loan to the borrower unless and until it is satisfied with its due diligence review in its sole judgment and formal loan documents prepared by AVANA's counsel are executed and delivered. Copyright © 2019 AVANA Capital. All rights reserved.